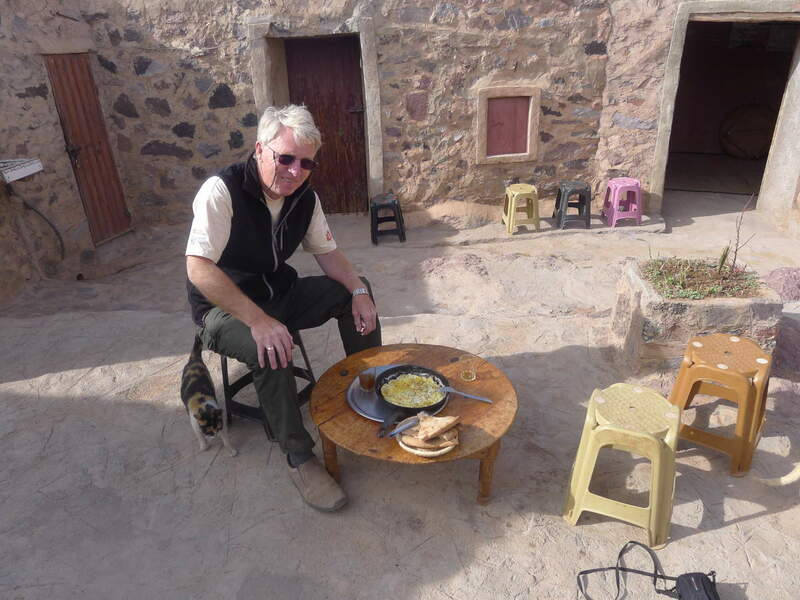 I thought I'd just add my personal views on the final week of driving in Morocco. Up until Monday last week we hadn't deliberately taken the Mog off-road. I say "deliberately" because with some of the Moroccan "roads" it's difficult to tell. 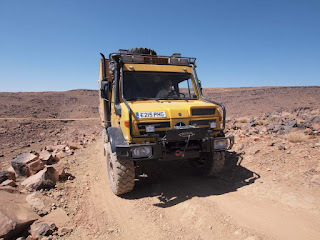 Anyway, we decided to take an old "piste", as off-road tracks are referred to here, from Zagora to N'kob and then another piste over the Jbel Sarhro, which is an offshoot of the High Atlas, to Tinerhir. The first part to N'kob was no different from many Australian desert tracks; rough, rocky, bumpy, a few dry river beds but nothing bad. The bit from N'kob was another matter. It started out as just another rough track but, as we began to climb, it got steadily worse. N'kob is around 650m above sea level and the top of the track, the Tizi n'Tazazert pass is 2,300. It's 40km from Tinerhir but it's not a straight ascent. There are many ups and downs where the track climbs 300 metres in a short distance and then immediately drops 250m. The track was exactly that, a rough idea of the path to be followed but in no way was it any kind of road. Potholes half a metre deep, boulders, hairpin bends, landslips, 150m drops at the side; it had the lot. Interestingly, I didn't need 4 wheel drive in the Mog because of the huge ground clearance and low-down grunt. Even though I had to stop and reverse, with a huge drop at the side, to get round some of the hairpins, the Mog coped perfectly well in 2WD. In the Land Cruiser I'd definitely have been using low range. By the time we stopped at the top I was absolutely exhausted. The Mog took a real pounding and at one point a lot of banging and movement from the roll cage started. When we got to the top I found that one of the mountings to the chassis had sheared. Next morning the noise and movement got even worse and I concluded that the other main mounting must have gone. That was the point where I gave up the off-road ambitions and drove very slowly to the bitumen road. Kate has already told the story of the wonderful mechanics in Tinerhir. So, I thought that was the end of any really stressful driving. By this time I'd ceased to regard the typical Moroccan driver's insanity and "insha'allah" attitude as abnormal, had adjusted my driving to cope with it and thought I was doing quite well. I was about to be sadly disabused of this belief. Kate has already written about our drive over the Rif which is the hash capital of Morocco. From the driver's seat it was probably the worst drive of my life. The road surface, although bitumen, is horrendous with camber changing in the middle of bends, crumbling edges, potholes and only just wide enough for two vehicles, IF the two are driven by sane, competent drivers. Neither of these adjectives can be applied to the average Moroccan driver. At many points there's a 200 metre drop at the side. The Rough Guide's comment is that "the road sees relatively little traffic". Wrong! I can only presume that they travelled at 2.00 a.m. There was every size of car and truck plus buses and, worst of all, an incessant stream of "grands taxis" (generally 30 year old diesel Mercs containing 6 passengers plus the driver) driven by suicidal/homicidal maniacs who had obviously been smoking dope all day. I lost count of the number of near accidents we saw with these lunatics. One of their favourites is to overtake on the outside of a blind bend going uphill. More than once I came round a bend to find one of these bastards in the middle of the road and a big drop at the side. To make it worse, every crappy, filthy town we passed through appeared to have a market on with the resulting traffic chaos: cars seemingly abandoned everywhere and anywhere, donkeys being loaded in the middle of the road and most of the population bombed out of their heads from smoking dope and wandering about randomly. All this was aggravated by lunatics leaping into the road waving packets of dope and cars flashing their lights and trying to stop us so they could sell us dope. We'd heard about drivers being boxed in, stopped and forced to buy dope and it looked at one point as though a character in a Peugeot 205 was trying to make us stop. I think, however, that in spite of being bombed, he got the idea that 8 tons of Mog running over a 205 was no contest and gave up. The stress of coping with the awful road surface while trying to deal with the totally unpredictable behaviour of everything else on the road was horrendous and by 15.30 I was completely exhausted with about 100km to go. This doesn't sound much but, because of the road conditions, we'd been averaging under 40kph. Normally, we'd just have found somewhere off the road to stop and stayed for the night but that wasn't an option in this part of the world with all the nutcases running around. Somebody would almost certainly have tried to break into the truck during the night. We eventually got to the campsite in Chefchaouen around 18.30 and looking back on it 24 hours later, I can't actually remember any of the last half hour at all as I was so knackered. The combination of the road surface, which would have been no problem on its own, and the total lunacy by which we were surrounded just did me in. The drive over the Jbel Sarhro (High Atlas) was tiring, mainly because of the size of the Mog, but there I only had to contend with the road. We're now back in Spain and I've had enough of driving in Morocco. The driving isn't quite as bad as Indonesia but I get the feeling that they're working on it. I guess I'm just to old to cope with this kind of stress. However, it was a timely reminder of third world driving standards and an indication of what will have to be faced on the journey back to Oz. Simple. you are reading Off piste incorrectly. It should read.... off pissed. please correct all guide books accordingly.